7x65R ammo is a very potent cartridge designed in 1917 by the famed German firearms and ammunition designer Wilhelm Brenneke, of arms and ammunition manufacturer Leipzig arms. The 7 x 65R is a result of the European, specifically the German, fascination with break open rifles. 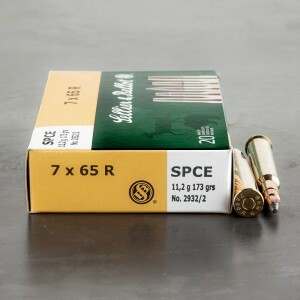 The 7 x 65R is a redesign of the 7 x 64 Brenneke cartridge with a few primary differences. The 7 x 65R features a rim on the end. The R is 7 x 65R stands for rimmed. This rim is added to allow the round to eject easier than a non-rimmed round. The popularity of the 7 x 65R is due to several different factors. First off the 65 mm case is exceptionally long, this makes uses a lever or bolt action unwieldy to it’s excessive length. Another reason is restrictive gun laws in European nation makes obtaining repeating weapons difficult. Another advantage is the ability to have double or triple barreled weapons that can chamber multiple calibers. The round is so popular in Europe that American companies like Winchester have produced break action rifles in the caliber. A 14o grain projectile can produce velocities of 2,700 feet per second.